The Oxford Guide to Heraldry contains the above illustration of the arms of Thurstan Tyldesley, taken from the records of the College of Arms and apparently dating from around 1560 [FN1]. Thurstan Tyldesley is included in the Tyldesley Pedigree published by Gillow and Hewitson and was the father of Sir Thomas Tyldesley 1557-1635, the prominent lawyer of Gray's Inn. 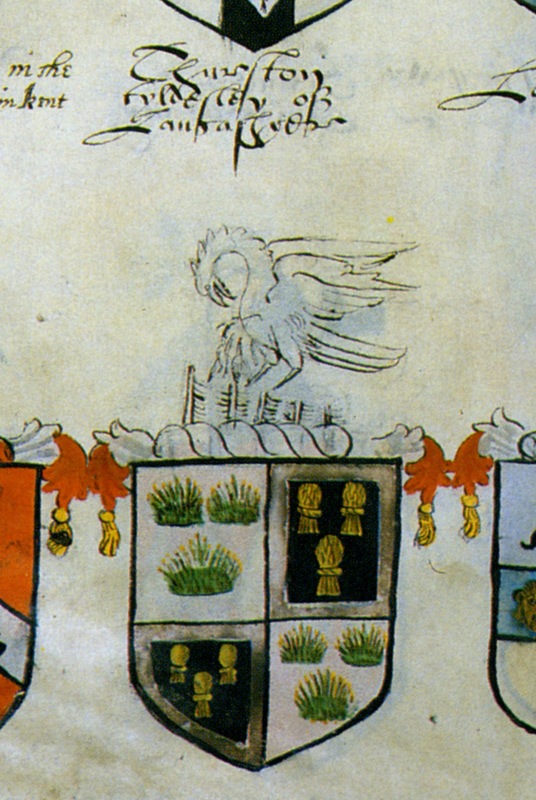 The arms are quartered and reflect the marriage of Thurstan Tyldesley's father Thomas Tyldesley to Jane Birkenhead. Tyldesley (1 & 4) is argent, three molehills vert, and Birkenhead (2 & 3) is sable, three garbs Or, a bordure Argent. At Fox Hall in Blackpool, built by Edward Tyldesley 1635-1685, there was a stone carving of a pelican in its piety. Unfortunately all traces of Fox Hall were lost in the 1990s when it was demolished and replaced with this hideous building. 1. The Oxford Guide to Heraldry, Thomas Woodcock and John Robinson, 1988 (Plate 10).